The seventh edition of @SEA, the Poetic Research Bureau's monthly live magazine, falls auspiciously on May 1st, so naturally, we have accepted its mission, and name the occasion: MAYDAY! 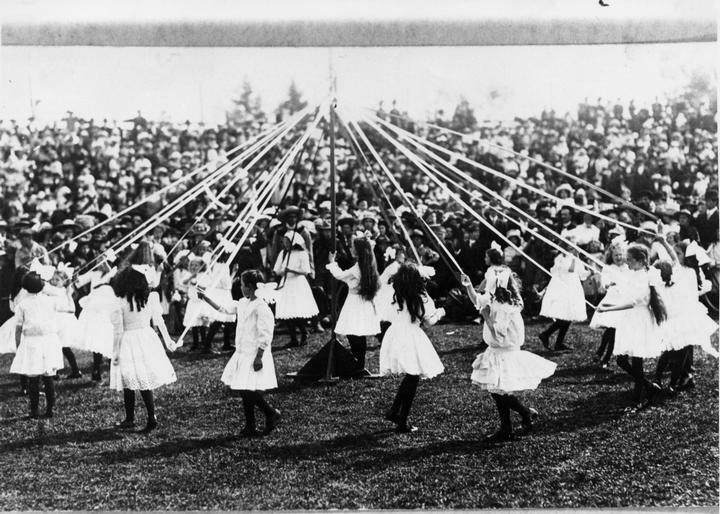 Come join us this Sunday for a program wound about the thematic maypole of labor and emergency. Three film screenings on hidden work & hidden leisure from Adele Horne, Luciano Piazza and Humphrey Jennings. A talk on the monetization of attention from Luciano. And finally, a visit from The Reader's Chorus, who will evoke "El Lector" of the Lectores de Tabaqueres, the professional reader(s) who would entertain Cuban cigar workers in the earth pre-radio 20th c. The Chorus will perform a specially curated May Day selection of texts for our audience. Spring into action this weekend at 951 Chung King Rd! Adele Horne screens an excerpt from her feature "Maintenance"
ADELE HORNE makes documentary, essayistic, and experimental films. Her work has screened internationally at venues such as the Rotterdam Film Festival, Images Festival, Museum of Modern Art, Ann Arbor Film Festival, and the Flaherty Seminar. Her film The Tailenders was broadcast nationally on P.O.V. and won the "Truer than Fiction" prize in Film Independent's Spirit Awards. She is a faculty member at California Institute of the Arts. HUMPHREY JENNINGS (1907-1950) was an English documentary filmmaker and one of the founders of the Mass Observation organisation. Jennings was described by film critic and director Lindsay Anderson in 1954 as: "the only real poet that British cinema has yet produced." LUCIANO PIAZZA, a filmmaker and critic, was born in Buenos Aires, Argentina. He studied literature at the University of Buenos Aires, creative writing at New York University and film at California Institute of the Arts (CalArts). He works in the intersection of audiovisuals and text. He is interested in the passivity and agency of spectatorship and the role of attention in societies of spectacle. He lives in Los Angeles, and is currently the Project Director of Ism, Ism, Ism, Experimental Cinema in Latin America, Los Angeles Filmforum's contribution for the Getty PST LA/LA. THE READER'S CHORUS, organized by CalArts faculty Sara Roberts and L.A.-based artist Jordan Biren, consists of composers and musicians, visual artists and filmmakers, writers and poets. Initially brought together to perform Robert Lax and John Beer’s rarely performed Black White Oratorio, they are inspired by this hallucinogenic poem and the possibilities of sound in a group of speaking voices, and continue to explore texts meant for performative group reading.